This week's tablehopper: ice cream weather. 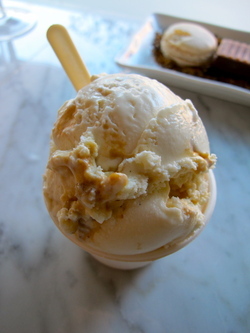 It’s a perfect day to go get holiday ice cream from DeLise. Photo: © tablehopper.com. Um, wow. Are we all feeling a little calmer now? I know I’m not the only one who loathes the wind with a passion (long hair + lipstick + wind = cranky girl). But I love how the Santa Anas seemed to blow out every single last vestige of wind in the city—it’s so gorgeous and calm out that my workout in Alamo Square this morning was actually kind of enjoyable. I know, weird. When it’s 73 degrees out, it’s a little odd to be writing about the holidays when I’m actually thinking about getting an ice cream instead, but that’s why we live in California. Right? Today I’m doing something a little different: a friend sent me an email asking where to hold a company/office holiday dinner party (in addition to about three other similar emails I have received in the past week), so I thought I’d do a round-up for y’all. It might be too late for some of you pre-planning types (sorry), but you can save the list for next year. Okay, I need to get back to shoveling this massive pile of email. It may not be snowing out, but my inbox is buried under a snowdrift of pixels. Halp.